You may have seen my recent Father's Day gift guide which included a wide range of products. However sometimes you want to find some items that are a bit more luxurious and this is where AMARA come in. Stocking many designer brands including Ted Baker, Ralph Lauren, and Tom Dixon to name a few, AMARA is the place to shop for that luxury gift knowing that they cater for a range of budgets. I decided to involve Stuart and let him pick out some items to include that not only he likes but he felt other Dad's would like this Father's Day. There is such a wide range of items to choose from in the Father's Day gift section. He found it slightly difficult to choose with there been so much to choose from and eventually settled on five items. Stuart enjoys having a glass of beer over the weekends and so he chose this 750ml beer tankard. The tankard is of great quality the glass is thick and the handle is very sturdy. For £20 its a great gift for beer enthusiasts. The chic leather pouch keeps this multi-tool contained. - a metal rasp and chalk. Ideal for repairing small breakages or repairing tyres. This is a great item and a fantastic idea for Fathers Day I think. I like the look of the multi-tool - such a versatile product! That bike kit is perfect isn't it. Looks like a really handy size to throw in my husbands bag. Dads are so hard to buy for! Some lovely ideas here! 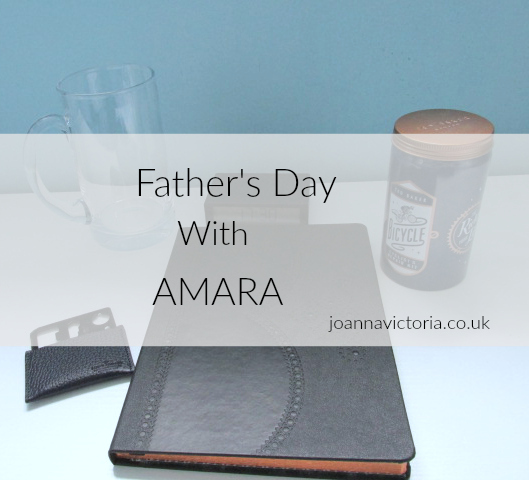 Amara is always my go to for homeware and gifts.. always find something special! I love the alarm clock! My husband would love that! Fab gift guide! I was reading this not expecting to see anything my dad would like but that bike repair kit sounds ideal. He's really in to mountain biking. Thanks for the inspiration. I love AMARA, my guilty pleasure when I get 5 minutes to myself. some great options, I am really struggling this year with what to get my dad and this gave me some inspiration! I like the sound of Amara, especially since it stocks Ted Baker. I like the sound of the notebook! The leather credit card multi-tool would be an awesome gift.You have a good list right here. I've had many people recommending me Amara, I seriously got to check it out. I absolutely love the bike repair kit, what a brilliant idea! Fab ideas for a Father's Day gift here. Need to get the gifts sorted asap. Some great choices for pressies here, especially the alarm clock, as my dad is always late lol! i haven't ever checked out amara but it sounds great, thanks for sharing!